We stand behind our products, and our warranties reflect this confidence. 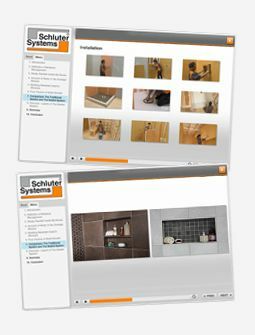 Here at Schluter, we have a comprehensive warranty program that includes System Warranties, Lifetime Warranties, and Product Warranties. Our System and Lifetime Warranties have you covered. Full resolution. Full cost. All the way down to materials and labor. Check out the video to find out how our System and Lifetime warranties stand out from the rest. A full resolution warranty covers you on the full cost of your project: including both materials and labor. Many other warranties only cover the cost of product replacement, leaving you on the hook for the tile, setting material, and labor costs. You get the same warranty coverage from Schluter on Day 1 as you do on Year 10. No depreciated value, no hassles—just coverage you can count on. When you install DITRA or DITRA-XL, the Shower System, KERDI or KERDI-DS, DITRA-HEAT or DITRA-HEAT-DUO with one of our Schluter thin-set mortars, your installation may be eligible for lifetime warranty coverage. Our products are designed to work together, and are warrantied together when they are installed as a system. Have an issue? No more finger pointing between manufacturers. One, single source warranty makes everything, simple. The DITRA-HEAT System 15-Year Limited Warranty and Lifetime Thin-set System Extended Limited Warranty both require registration. Register now. Get an overview of our warranty program and download any of our product or system warranty documents. Click here.